The holidays are officially over, and have been for sometime now, but I haven't had a chance to post one of my favorite things I made this season. Some may look past this post thinking it is too seasonal but like Louis Vuitton, chocolate and gingerbread are always en vogue. Strangely, I had been craving a chocolate gingerbread cake (no I'm not pregnant) since mid-December and finally got around to baking one just after Christmas. Here it is now late January and I am just blogging about it. Normally I would let the recipe pass without a post...yes, there are lots of things I cook that never make it to the blog. Not this time. I was smitten with this cake from the start and it's one of those desserts that got better with every bite. Preheat the oven to 325ºF degrees. Grease and flour a 9-inch bundt pan with butter or cooking spray and set aside. Combine the butter, molasses, dark brown sugar and 1/4 cup water in a medium saucepan over medium-low heat. Cook, whisking constantly, until the butter has melted, then pour the mixture into a large bowl and let it cool for 10 minutes. Once cooled, whisk the eggs and milk into the molasses mixture. Sift together the flour, cocoa powder, baking soda, salt, ground ginger, cinnamon, allspice and nutmeg into a medium bowl. Gently fold the flour mixture into the molasses mixture, stirring just until combined, and then stir in the chocolate chips. Pour the batter into the prepared pan. (See Kelly's Notes.) Bake the cake for about 30 minutes, or until a toothpick inserted comes out clean. Allow the cake to cool fully while still in the bundt pan. Make the glaze by whisking together the sifted confectioners sugar, heavy cream and vanilla extract until smooth. Once the cake has fully cooled, invert it onto a serving platter, drizzle with the glaze and serve. 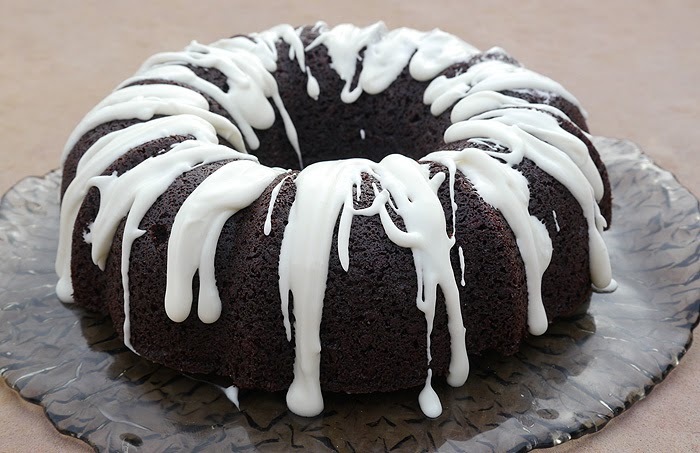 Lovely recipe for a bundt cake. I hope mine will look like yours when I make it next weekend. This is gorgeous!! You are so creative… I love how you made this fun for everyone!